Rock Out Youth Poverty is an annual event hosted by the Salesian Youth Movement USA West to promote poverty awareness that is taking place around the community and the world. Rock Out Youth Poverty is and opportunity where participants of all ages can come and learn about the different types of poverty that is happening around the world in different nations, such Gypsies in Europe or poverty in Africa by visiting our "Global Village". At the "Global Village" participants will have the opportunity to educate themselves about poverty by watching videos on kids living in poverty, playing emulators on how it's like to live a week in a third world country, interactive quiz on US poverty, and much more. Save the date! October 7th, 2017 at St. John Bosco High School, Bellflower. Check back later for more information. In the meantime check out some pictures from this years Rock Out Youth Poverty that took place in March. Eddie (left) and Antonio (right) De Leon Yac being interviewed by Eligio Marquez (center). Eddie and Antonio are immigrants from Guatemala and shared their experience on "La Bestia", an infamous train that immigrants ride from Central America, through Mexico, to the U.S border. St. Bartholomew Youth Group sponsored this years "Blankets for Youth" social outreach activity. Over 50 blankets were made and given to youth living in the margins. Dany Benitez and his Zumba group sponsored this years Hygiene Packs for the Homeless social outreach activity. Hygiene supplies were collected and given to the homeless in the streets of Long Beach. One of this years main exhibits "The Wall" on display. "The Wall" exhibit showed our young people the stories of young immigrants and the hard struggles and decisions they live with everyday. 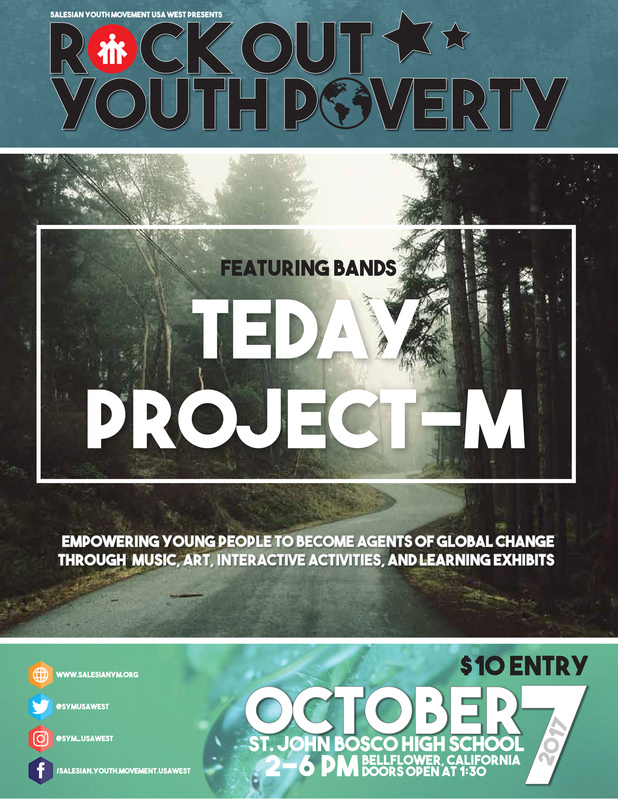 Countdown to Rock Out Youth Poverty 2017. Hope to see you there! Here is this years flyer, feel free to download it, print it, and post at your local site.